Retreat into a world of care, where time is left at the door, and a new journey begins. Feeling stressed or tired? Want to recharge, reenergise, and rejuvenate body and mind? At Duniye Spa we have created a holistic space of healing, touch, and aroma, to promote a deep sense of calm, joy and serenity from within. Experience the balance between inner and outer beauty that brings about contentment. Drift away with a combination of oriental traditions and modern skincare in a nurturing and inspiring ambience at our Maldives spa. Referring to the original meaning of Duniye (universe) we honour a universal, holistic approach to health and well-being. Our spa services are inspired by traditional and modern therapies from around the globe with an emphasis on regional healing traditions from Asia & Africa. Our professional and caring team provides holistic spa treatments with a high-touch and low-tech approach. Mindful connection and healing touch alongside carefully selected premium natural products are the foundation of all services. HealingEarth™ and PURE™ product lines are developed in line with the latest scientific research and contain only the purest natural active ingredients to deliver outstanding results. Our spa facilities, services, and products are created in honour of nature’s healing energy, its sustainability and in respect of our human need for relaxation, beauty, balance, and connection. We are here to serve, to inspire and to share our passion for beauty, healing, and well-being. Cancellation and No Show Policy: a 100% charge will apply for treatments cancelled with less than 5 hours prior notice, and for all no shows. 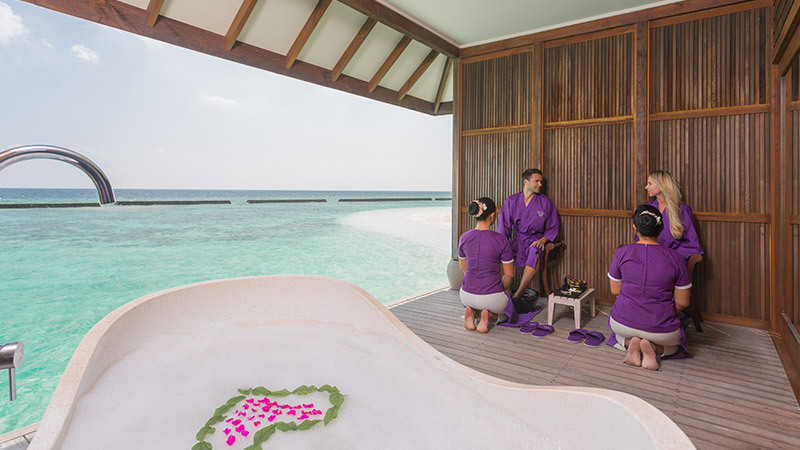 To book your desired treatment or request more information, contact our Veligandu Island Resort & Spa Duniye Spa Team at +960 753 4686 or via email spa@veligandu.com. Alternatively, dial the internal extension 644 from the telephone in your villa.